Mt Hiwi Trust news and events diary - whats been happening!! please ring 027 249-4255 (Richard should answer). Finally got to spend a couple of nights on the property (every other occasion we spent on the track - which is paper road). Phil, John, Andrew and Richard spent Friday night at the Mt-Hiwi Trig (or near the remnants), the following night halfway to Braemore Road, then out on the Sunday. Pretty cool, pretty steep, (pretty cold that first night), and pretty stoked! We'll post the GPS log - but there are few obvious routes - being the ridges, as the valleys are steeply incised. - uplift a 19 day old kiwi chick - or rather Sue from Taranaki Kiwi Trust led the operation - and Phil's parents departed the event early to deliver the little nipper to Rotorua for raising. - run a trap circuit. Phil H, Richard and Andrew walked the new track cut by WACNZ in May this year. It's a typically steep descent and ascent up to the fenceline. We saew lots of slips - the head of the catchment having a lot of damage - and 16 fewer bird killers. Thanks to all those others who continue to help in the form of hunting (7 goats a couple of weeks ago, thanks Allan), reset traps (thanks TRC, WACNZ), and the new trapping line (again, WACNZ, TRC and BCF - now the Community Conservation Partnerships Fund). Phil H & Richard visited during a bit of rain. We decided it wasn't appealing to walk the Heffernan track, so decided to walk to the northern end of Moturoa Road instead. We lunched near the Mt Hiwi trig, then accidentally found it - a 50mm diameter pipe about 50mm above ground level!! We succeded in walking to our neighbour's corner, but it's not the track that the first part of the road is. Phil visited with the Taranaki Kiwi Trust for an overnight trip to uplift two kiwi eggs previously located. It turned out there were three eggs(!) but only one live one. The remaining egg was taken to Rotorua to be hatched and will be taken to the Lake Rotokare sanctuary when about a month old. The chick has been given the title Moumahaki. Mixing it up with hunting and maintenance work, Will and two shooting mates slogged after goats over a dry, dry few days, hunting high and low. Richard, Phil, Kez n Joe all kept very much away and amused themselves shifting & setting traps before settling down in Kez's spacious more-of-a-fabric-covered-palace-than-a-tent. Kiwi were heard about 10pm, and also later when Richard proved to be a kiwi whisperer - courtesy some pretty fancy snoring - eliciting a call and response with a close bird some time in the night. The shooters enjoyed a comfortable night at the lodge. The take-away from the weekend was... airbeds good! Visit by the Taranaki Botanical Group. Thanks people. It'll be interesting to see what you all saw. Not really Trust work, but a buncha likely lads from ICONZ and even more supervisory adults spent a night tenting on the track and wallowing in the glory that is descending then ascending hundreds of metres of steep bush. From the sound of it they had a good trip. One glorious, but sober, note was the amount of rewarewa flower noticed. Promises to be a challenging time controlling an expected explosion of pests next year. Delia and cohorts set up some bird monitoring stations. They also used a recorder overnight down in the wetland. There was a little breeze that night and some inquisitive sounding creatures, oh and kiwi calls!!!. Here're a couple of sound files (as mp3) of some calls, File 1 and File 2, both roughly cleaned up to remove most of the wind noise. If you'd like them as wav files, then try these links (hosted at mega.nz because we have limited capacity on our site) for File 2 once it's had most of the wind noise removed and amplified a little, or the original file. Just want to note that, whilst all these trips are going on, so are many more by trap checkers and possum whackers. The never-ending work to protect our ecology continues apace by all and sundry. Many, many thanks to those out there across New Zealand involved with this work. 8 of us spent the weekend shifting 50 new DOC200 trap boxes on to the track around our head catchment, including the nice new track that WACNZ made for us. One of the eight was Jake Goonan from TRC, who showed up at a-lot-earlier-than-we'd-expected o'clock on Saturday morning (all the while apologising for being late) with the 50 traps in a trailer. We split into a mix of people who converted the traps to the Friends of Rotoiti bottom hinging ones (soooooo much easier to clean and set), some to lug the reworked traps along the tracks and one Facebook(tm) afficionado to wave his chainsaw around cleaning up the deadfalls across the tracks. Five of us visited the site, staying overnight in salubrious pup tents. 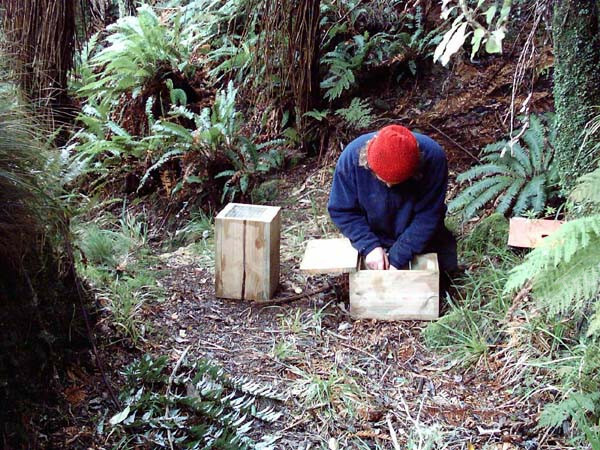 The weekend's goal was to convert the existing and all new DoC200 trap boxes to hinge at the base (idea courtesy of the Friends of Rotoiti), replace as many corroded mechanisms as possible, and to liaise with WACNZ to arrange for the clearance of a trapline from the head of the catchment around the western ridge to join up to the fenceline. Another big thank-you to Leicester and Brent who have repeatedly returned despite the rigours they (repeatedly) encounter. The TRC are considering assisting the Trust with a biodiversity management plan (TRC link). It'll be a great boost if this goes ahead. And will then tie up all those idle moments we never thought we had. We expect to hear in early July as to whether we make this year's selected sites. Four of us visited the site, staying overnight at the adjacent Mt Hiwi Lodge so that we could easily get up to listen to the dawn chorus - windy though it was. We met up with Taranaki Regional Council representatives to discuss options for managing the property, then completed a circuit of the sanctuary area, finally sighting the fabled fence, and noting the fence's ability to mumify goats caught in it. A little fence maintenance was completed, and a weary but jubilant crew returned to Wellington that night. Quite worn out, but what a fantastic piece of land to wander around. Photos to follow. We'll be at the Southern Cross Bar, 7:30pm, Abel Smith Street, Wellington. They are liaising with those who regularly access the property, but please note that we do not want anyone else visiting while hunters are active on the block. The stock-proof fence has been completed. This will allow us to complete the covenant on the Reserve Block. We have received news of the death of Terry Heffernan, from whom the Mt Hiwi Trust purchased the Mt-Hiwi block. Terry had wanted to carry out the work we're doing, but circumstances prevented him from doing so. However, his generosity and patience greatly enabled the Trust to purchase the land and continue with his vision. February 2010 .... A possible fencing tenderer #2? Given the lack of action by our contractor, DoC have advised that the tender is to be re-let. Yes, legal action was considered, and no, it's not considered worthwhile. Unfortunately, our moral high ground will be a year behind on being fenced. Absolutely no action has occured on our fence. The materials are all laid out (have been since March), but our contractor is apparently happy doing other work. A contractor has been signed to carry out a shorter fence than originally envisaged (due to higher than expected labour rates). Completion is expected by mid-year. We have all the permissions needed to carry out fencing around the entire circumference of the Reserve Block. DoC are to carry out the fencing contract per agreement with the Nature Heritage Fund. I took out Rowan from the Mt Hiwi Trust on Monday night for a kiwi survey in there. Between 10pm and 2am (on listening sites) we heard two males and two females within the 300 odd ha property (we covered approx. 2/3's of it in listening coverage). There were a further two possible males, and another possible female, although they were a bit sketchy. So that's four to seven kiwi known to be present! Directly opposite to where we stayed, 3km south (the log cabin) we heard another two males on the farm there. I still need to make a map and put in the records etc for this survey - will come in due course. Just thought you might all like to know! The TKT and the Mt Hiwi Trust are now talking about potential trapping work at the site. They currently have 30 traps over a 2km ridge-track, which will be spaced out further. Another 20 to 30 traps will be made over the coming months by them as well. The TKT¹s new Community Kiwi Programme will make traps freely available to projects like this around Taranaki. The question is now, can the Mt Hiwi Trust commit to the trap checking regime? It is likely they will fund raise to cover trap-checking expenses by a contractor ­ ultimately. Good on you Rowan for driving the trapping work! Will be in touch. Ongoing trapping throughout the year! Still progressing with fencing plans. Meanwhile the land moves through the natural cycles of the seasons safe from interference at large. More trapping is happening all the time. Also, we are continuing to work on our fencing. Many thanks to all our supporters. As some may be aware, Michelle hopes to coordinate a trial of a "forest monitoring and assessment kit" (FORMAK). The intention is to try the kit out to see if it is worth the Trust purchasing one. All are welcome for the tryout, with the idea being for as many people as possible to become adept at monitoring. This will also be a great opportunity for Trust members to catch up, to see the property, check out the traps that have been placed, and to soak up some great bush. It's (past) time for another AGM. Take that ya vermin! R.
Well its been a great year for the Trust. Writing to you from early September, we have currently got 40 traps on the land for rats, stoats etc. Many thanks to volunteers and trust members for taking their time and energy (hard walking) to set these traps and to check them. We are moving closer to fence building and people have been working hard for the past 2 years to make this possible. We have funding approved for a deer fence so its coming together. Our resident hunter has been on the land a few times - and recently got 6 goats. We will be working towards regular visits to try and keep the goat population down. There have been a few slips through the land due to the wild weather we have been experiencing. But this is part of the natural order. People accessing the land have found it hard going, and the tracks are often overgrown with trees across them, making visits a bit of a challenge. However, its wonderful to see nature at her wild best! So, the land is doing well and we are starting to manage the pests in a more aggressive manner. We are also closer to fence building. The covenent should be underway in the next few months. Things do seem to take time but be assured - there are many people working hard in the background. We are still interested in new members and appreciate any input people have to offer. Please contact us (see below) with any queries and interest. We have archived the news from previous years, and this can be found in archives.